Shaping on the curved stake. This gives the piece shape and texture, but also compresses the metal, hardening it so the final piece is light, strong and resilient. Once the measurements have been laid out on the material the blank gets cut to size on my metal shear. 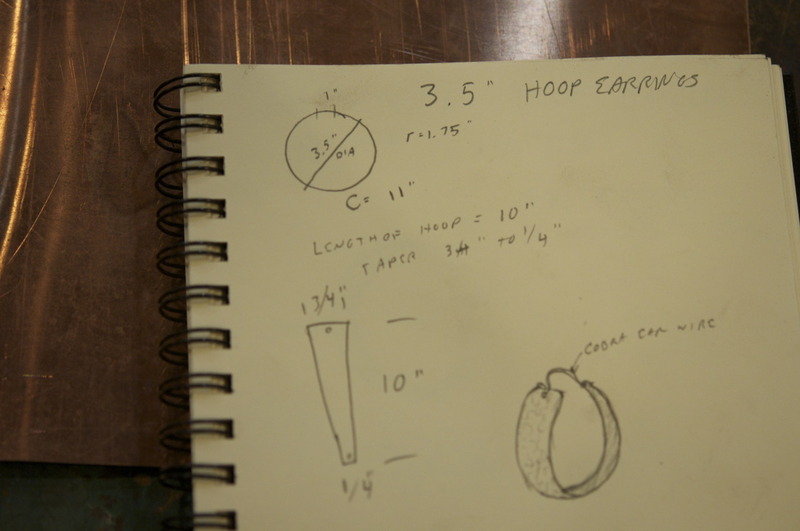 I knew the diameter I wanted my earrings to end up, so to start with I made a quick sketch on paper followed by some simple calculations to get my starting size. 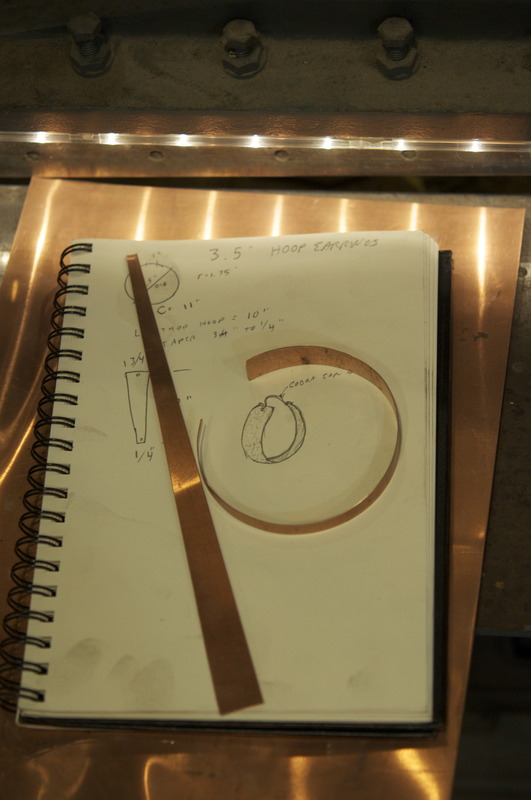 The Making of a pair of the new Big Hoop earrings. 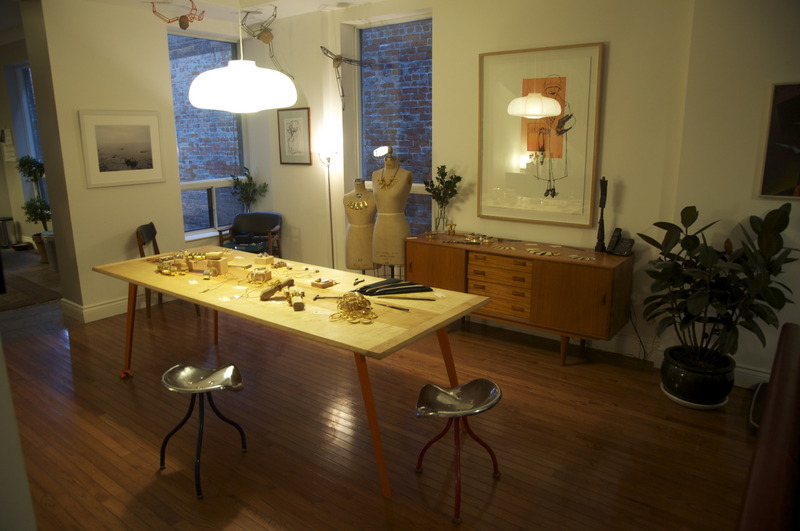 Thank you to everyone who came out and made for a terrific trunk show! It was great to see everyone and explore new designs together, and also to put the brand new dining room table I built to use for display. 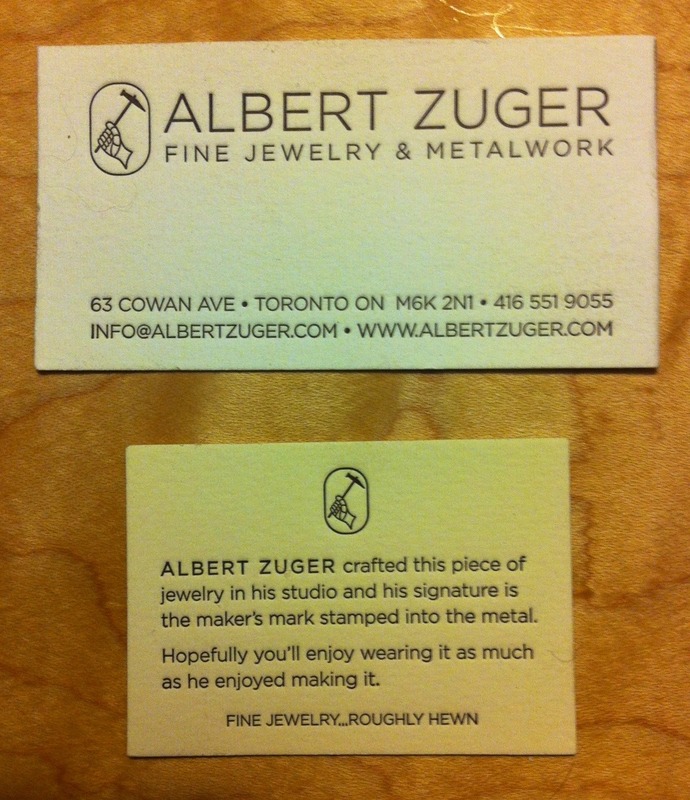 My amazing new business cards are hot off the presses! Thanks to Charita at Koolgirlposse for a sharp design direction and to Shelly at Sweet Peony Press for beautiful work printing them. The smaller package insert cards are also amazing, sporting the best tag line ever developed by a fantastic writer, and friend, Lauren Bride. Hi blog readers! I wanted to let you all know that very recently I had to increase pricing incrementally to meet rising material costs. The Trunk Show will feature last year’s prices, so if you make it in person next Saturday you’ll be able to purchase everything at a discount from the current web store prices. 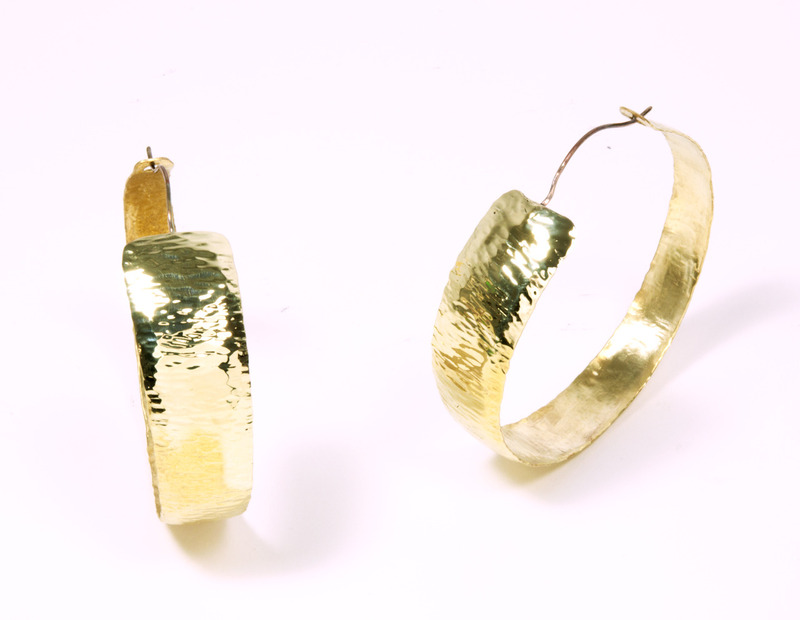 Check out the new Anticlastic Cuff, in gold-plated brass and silver. There will be several to try on and buy at the December 2nd Trunk Show, or you can contact me to commission one. 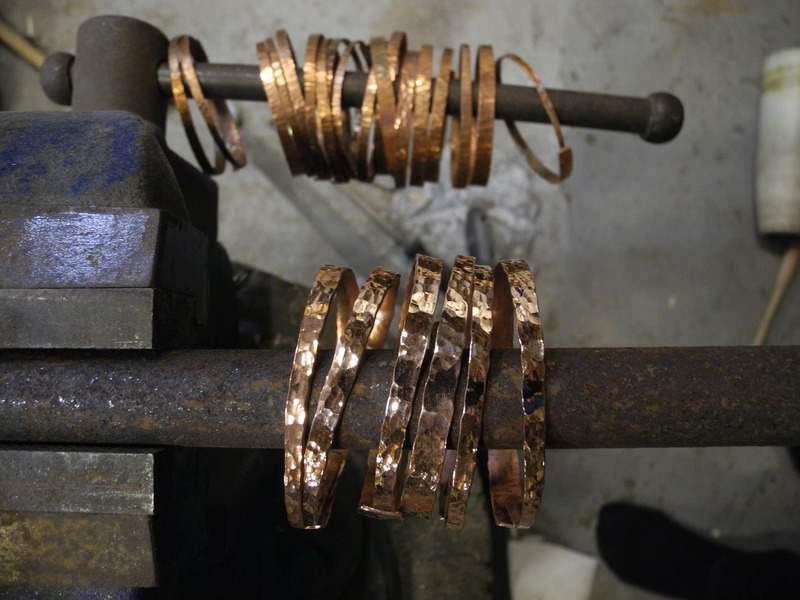 In production for the trunk show: bangles now come in pebble and ripple. 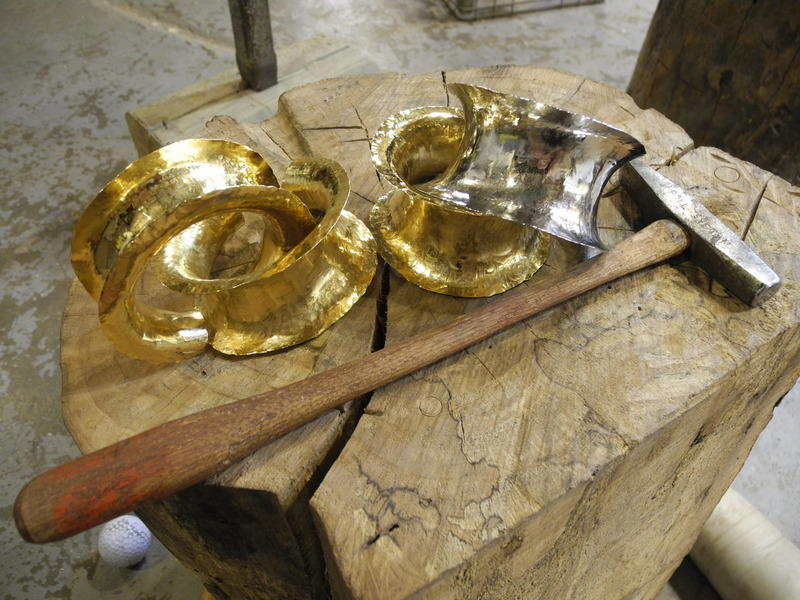 Here they are on the anvil before going off for gold plating. Olivia Wilde in Albert Zuger Small Hoop Earrings in Gold on the red carpet at the Ace Awards. 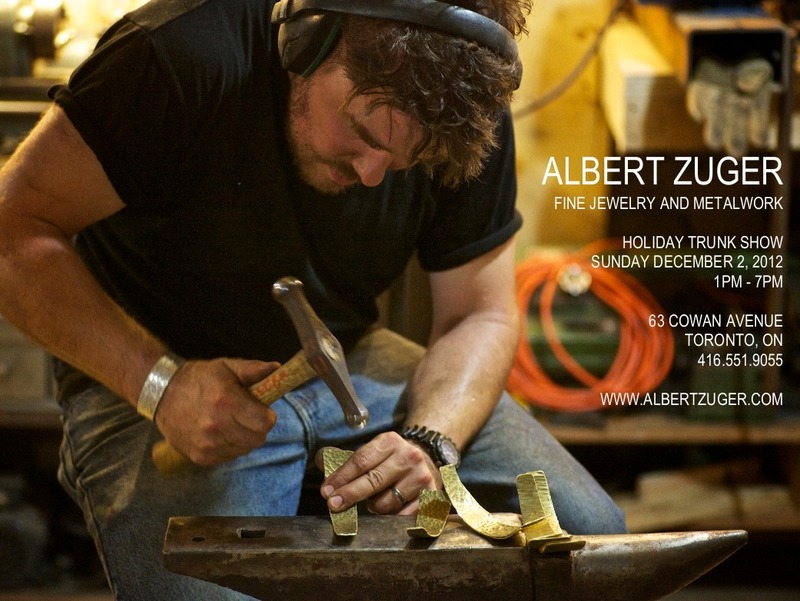 Exciting news - Albert Zuger Sterling Silver Cuffs featured on the Refinery29 blog! Recently, Ian Lefebvre shot some studio portraits and fashion photos for the AZFJ Spring Look Book and website. Ian captured the studio just right and turned a sketchy fall afternoon into a convincing spring day. Check back for more of Ian’s photos. How lovely is Lyla, btw? I worked really hard to get the gold edges on this one thick enough to balance out the steel. Even subtle shifts in scale allow me to try new things. 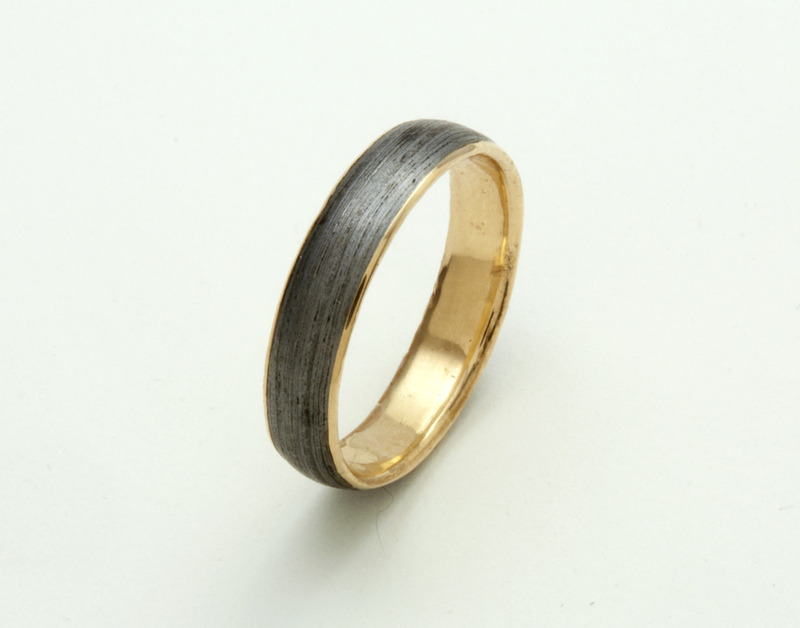 This ring is just large enough that I was able to show off the hammer marks on the surface of the steel. I think it looks great! Each of my custom pieces, no matter how simple, is an opportunity to create unique composition. I take a lot of pride in both the design and process. Things like balance and harmony, are just as important as fine craftsmanship and careful execution. I always smile when all of the elements come together and the final product looks “right”. The patterning in the steel is really showing nicely. 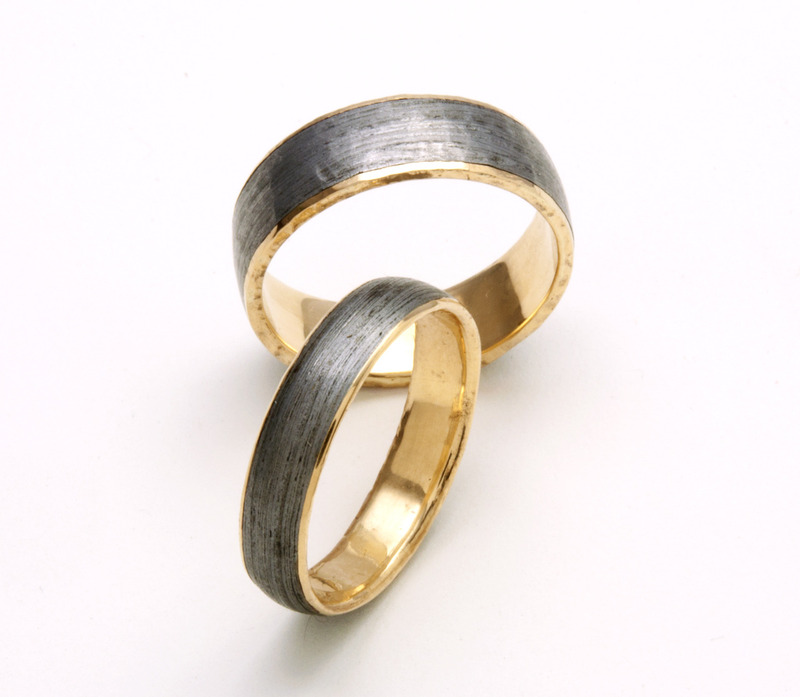 These are a great example of how a little bit of change in size and proportion make very similar rings into two very different pieces. 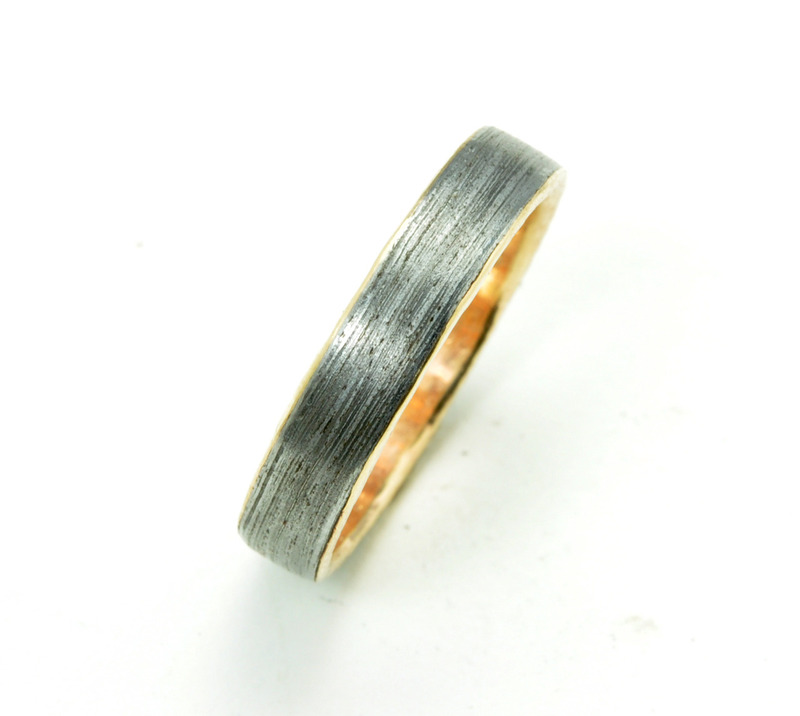 These are the latest custom wedding bands, and they are both going out tomorrow for weddings on Saturday! New ring! 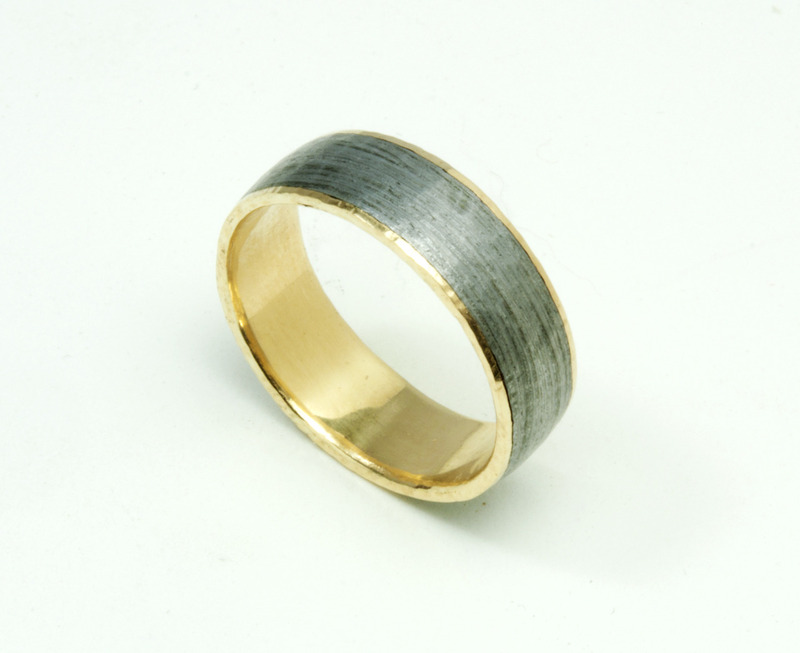 Here is the finished Meteorite/Bloom Iron wedding band. I am really excited about working with this material, it is truly unique. If you look closely at the texture you can see tiny specks of black in the steel. These are tiny silica inclusions that are a direct result of the smelting and forging of the Bloom Iron. When the Bloom first comes out of the furnace it is a spongy mass of iron, carbon, and silicon slag. With subsequent folding and forge welding, the silicon is heated to a liquid state and driven out of the bar. This process of consolidation makes the bar into a ductile and workable solid, and evens out the carbon content of the metal. An interesting thing to note is it is impossible to remove every trace of the silicon. There will always be tiny little particles of it distributed throughout the material. To me they are similar to a fingerprint. If you look really closely at ancient blades and tools, sometimes you can see these telltale traces. 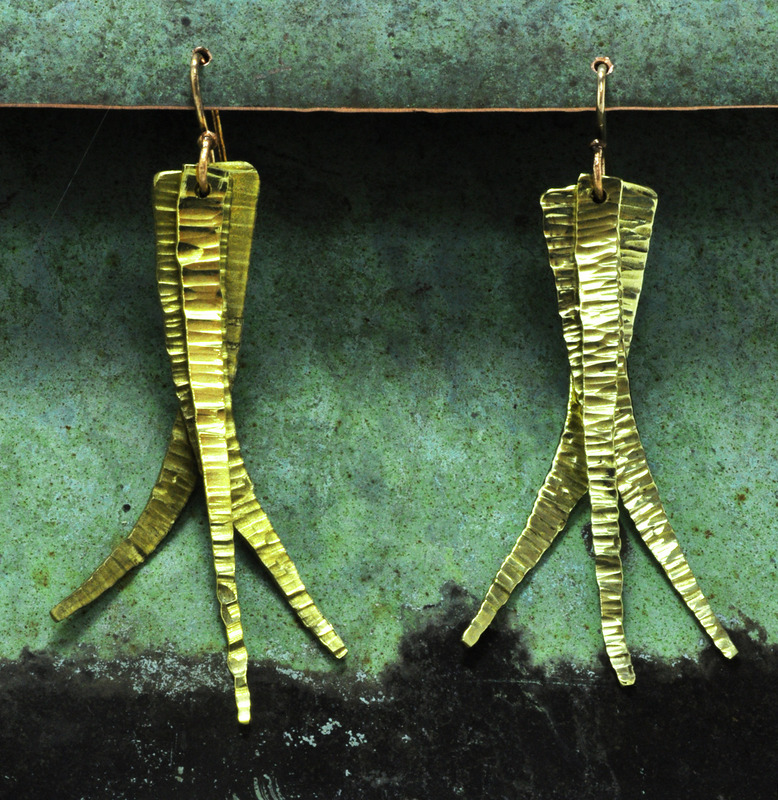 The Shard collection is now rounded out with earrings! I’ve a few pair that curve and twist, and some that are straight. It’s time to test them on people, and see how they look in the big wide world. 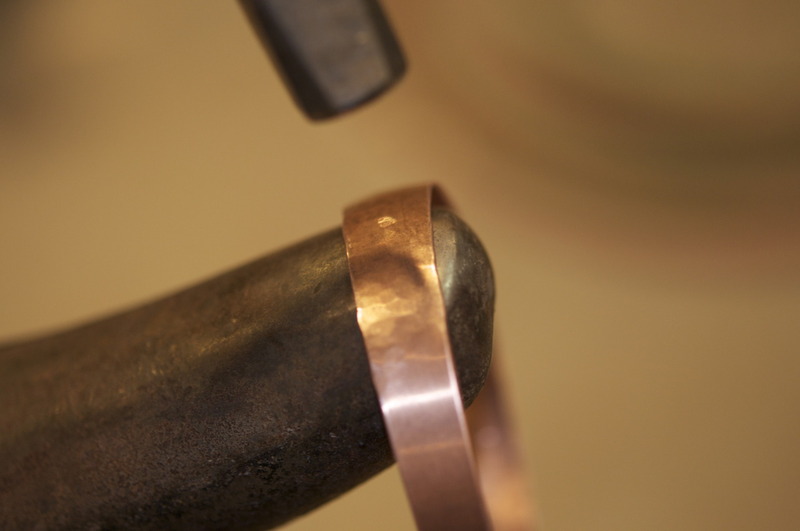 The new bracelet has a new fastening method which will now be used for the necklaces too. 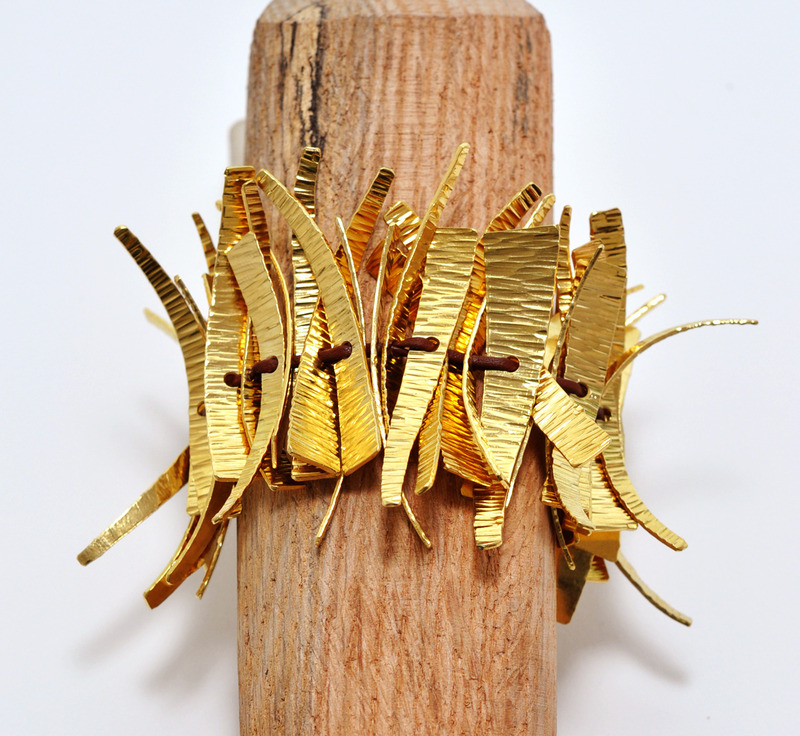 I am really proud of how it incorporates the the leather strands into the whole of the piece. Also, by eliminating the hook and using a single shard as a toggle, it reinforces the elegant simplicity of the piece. The Shard collection has been getting a lot of attention from me recently. 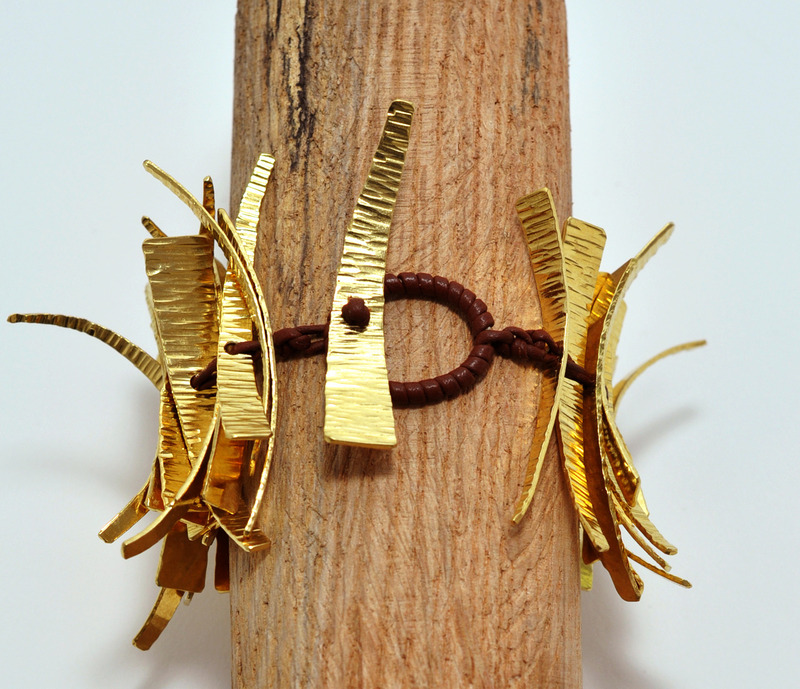 Introducing the new Shard Bracelet. Wild and unruly, the pieces shoot out in every direction and make a real statement. This piece is controlled chaos!